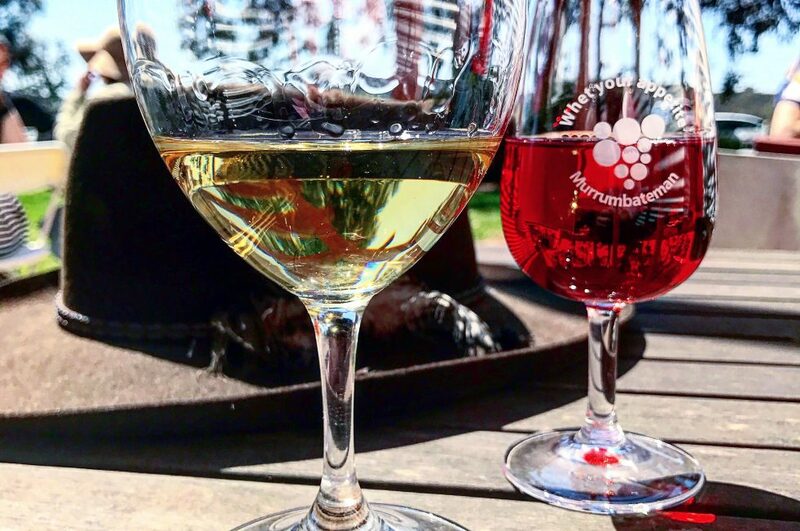 TGIF Foodie Fest and what to do with the leftovers. It was a cold, wet, miserable Friday evening. The working week had finally finished up. TTGLIF. Thank The Good Lord It’s Friday. I picked up Tweenie from Poppy’s shop and we headed to Woolies to get some cheese n biccies, a snack with which to end the week on. A treat. I certainly didn’t feel like cooking and I couldn’t justify spending money on takeaway. A few wedges of nice cheese, an olive or two, a bowl of pretzels perhaps, and a cheap, but reasonable red. A bit of BBC Midsomer Murders and my Friday night in was planned, and accounted for. Don’t shop on an empty stomach, they all say. Shop whilst full to the gills, they all say. Take a list they all say. It’ll save you money, they all say. Who the hell are “they” anyway? It appears they are right. Just look at all I bought. Was I expecting a small army? SO doesn’t eat all “that crap”, as he succinctly puts it. Tweenie will eat a little of it, and Buddy, who knows, depends on his mood. That’s a whole lotta party food. When loading up the trolley it really didn’t seem like all that much. And when I went to BWS to get a bottle of red, they had a shopping coupon deal on the Watchmans Shiraz, buy one get one free @ $14. All up the entire lot cost me $70! What a bargain. A little more expensive than a takeaway, I hear you say. True, true BUT I had enough food to last me a good two weeks. And I managed to make another 3 meals with the leftovers. In fact, I believe I also took some to work and had wasabi cheese toasties. Tweenie even managed to take some of the Triple Cream Brie on her ham and melted cheese sandwiches to school. A true foodies daughter she is. So, what did we have there? I will always seek out these food options if I can, and will promote them where possible, but I simply won’t feel guilty for shopping at Woolies on these occasions. 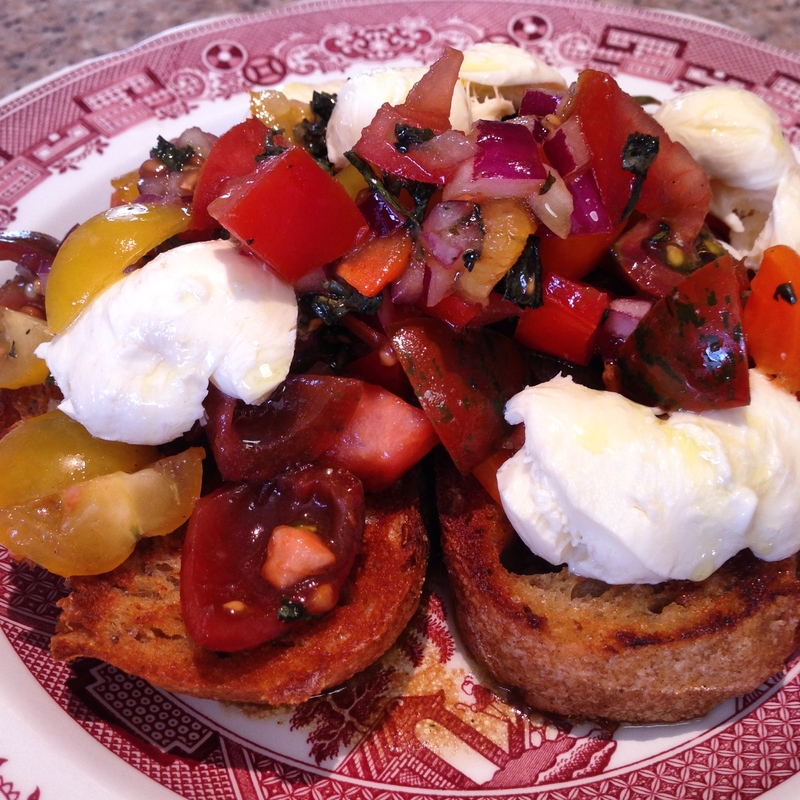 The first meal made out of the leftovers was a mixed tomato and bocconcini bruschetta. Drizzled with La Barre EVOO and some thick, sweet pomegranate balsamic vinegar, it was like a burst of summer in my dreary Canberra kitchen. I cannot wait to get my tomatoes planted in the next two months, and more basil than you can poke a stick at, you can never have too many basil plants in the garden. Can’t grown my own bocconcini though. 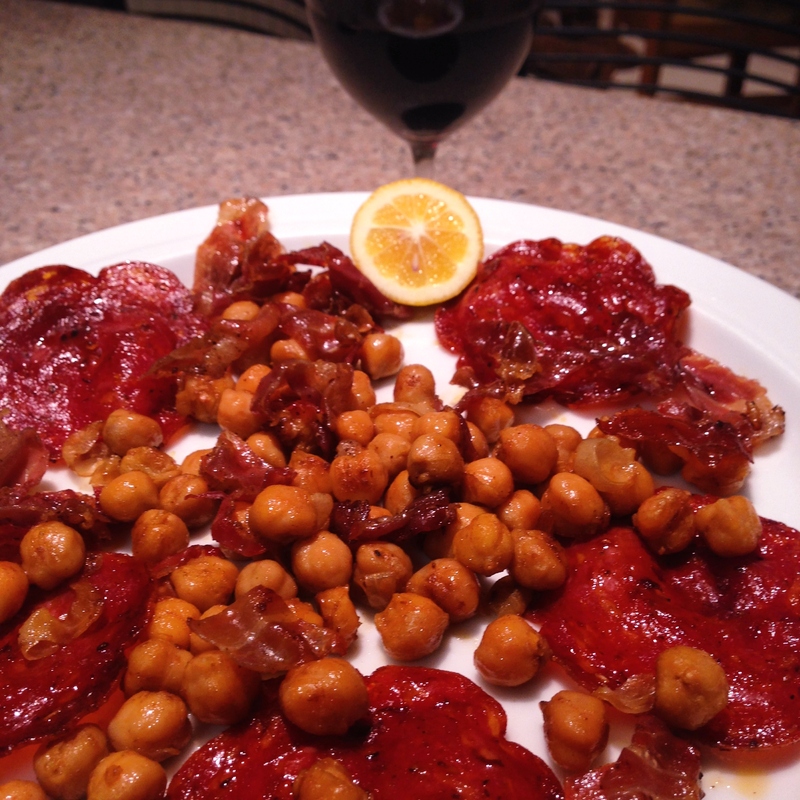 The second meal (or midweek snack) that I prepared that week, was spicy fried chickpeas and chorizo salami and prosciutto. I fried the charcuterie until crispy, removed from the pan on to some paper towel, added a good pinch of cayenne pepper, a glug of EVOO and added a rinsed tin of chickpeas. These were fried until crispy and well doused in the fiery oils. Served all on a plate with a squeeze of lemon juice and another glass of the Watchmans Shiraz. 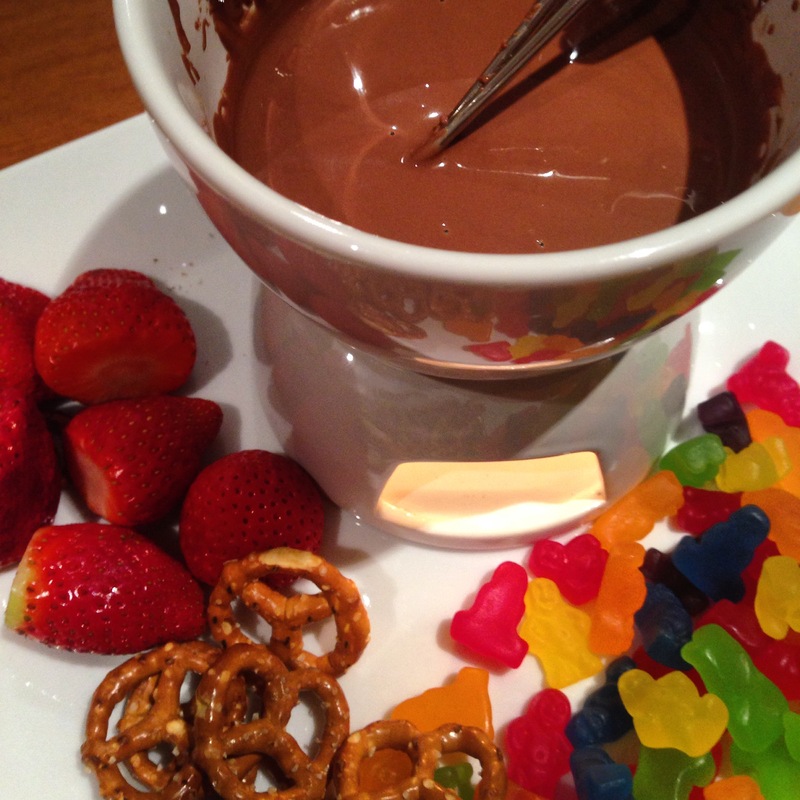 Perfect blogging food. 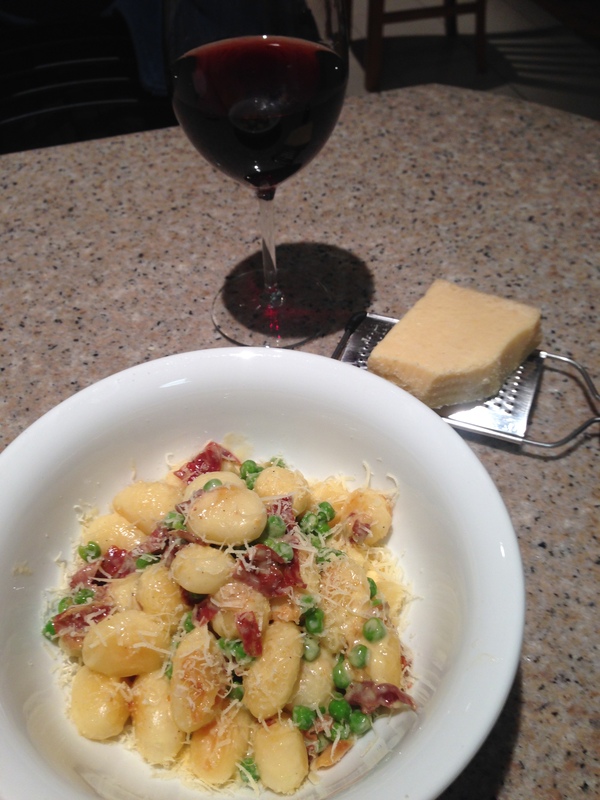 The 3rd meal made from the leftovers was a twice cooked creamy gnocchi with garlic, peas n prosciutto. 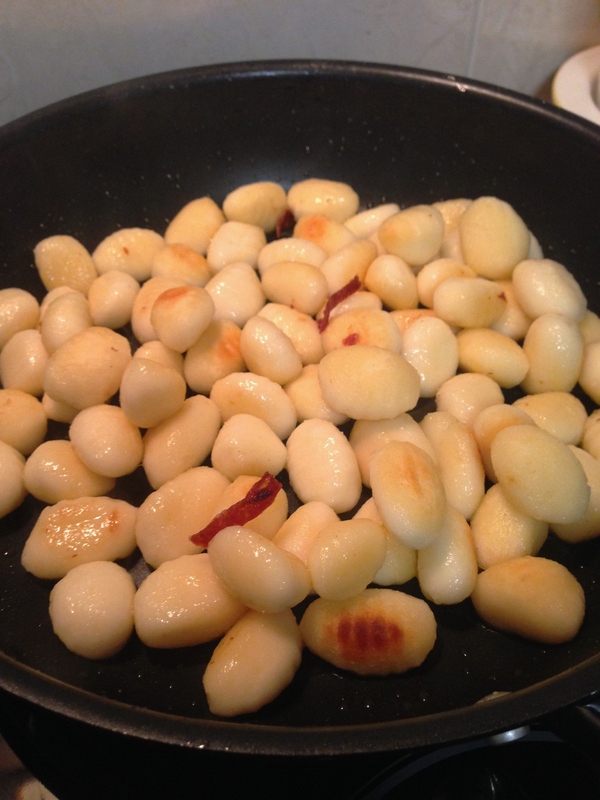 A packet of fresh (or frozen) gnocchi, cooked via the packet directions, drained and then chucked into a pan with a bit of oil to crispen and brown up. I learnt this little trick from the lovely Nigella Lawson – her Rapid Roastini are fabulous! It’s such a great little carb dish that’s just a little unusual, takes you away from the standard pasta, potato fare and gives a little hint of playfulness to a midweek meal. I love it. 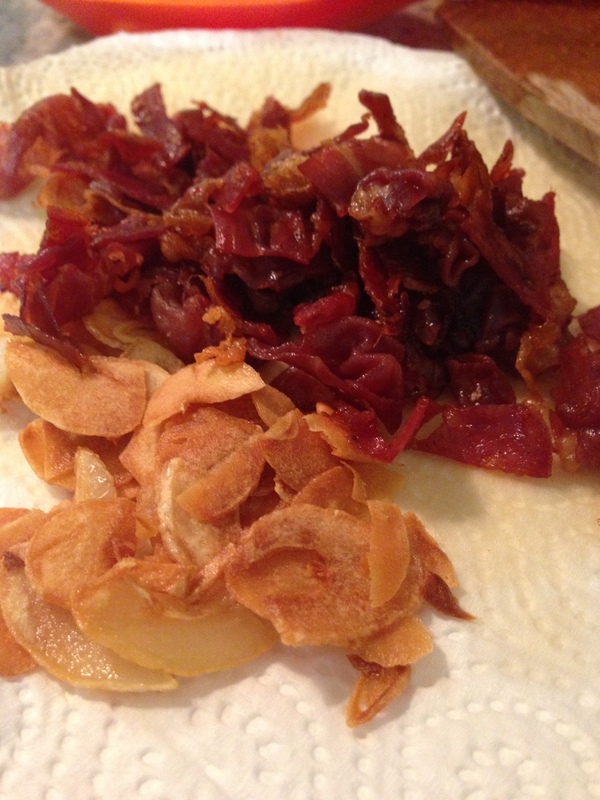 Pop the crispy golden pillows on some paper towel and add a couple of finely sliced garlic cloves and a couple of rashers of sliced prosciutto to the pan, adding a little more oil if necessary. The garlic is a main ingredient in this dish so you want it to retain it’s structure and to not brown too much, otherwise it will become bitter. Fry til both items are golden and crispy and drain on the same paper towel as the gnocchi. While all this frying is going on, boil up some frozen peas for greenness and goodness. Add about 300mls of cream to the pan and half a cup of chicken stock, and boil rapidly to reduce a little. Add the cooked peas and the remaining ingredients, stirring until the sauce thickens, the gnocchi is warmed through, but not too long as you don’t want to lose the lovely crunchy burnished texture of the other ingredients that you previously worked hard to achieve. 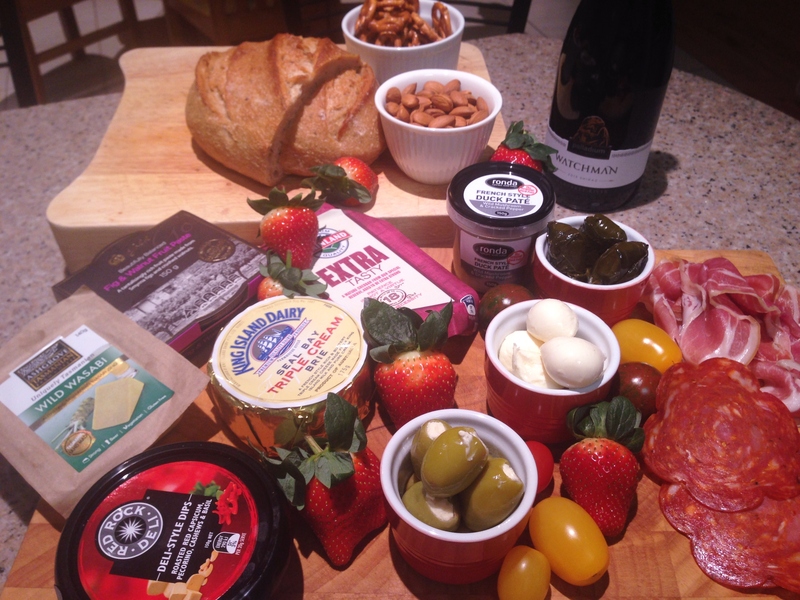 Serve it up with lashings of parmesan, or not, and a glass of that free Shiraz. So, $70 well spent I think. Lot’s of very good food, little effort involved, leftovers are always economical. Not too terrible on the waist (I shall keep telling myself), and all homemade. I love leftovers. Don’t you? I’m curious about why coles is worse than woolies? Hi Nyss! Purely personal opinion, m’dear. I’ve always found Coles never stocks the right brands that I’m after. I think, as the main shopper, you develop a preference early on, and I reckon Coles just doesn’t appeal to me. Never has. Wow – you got quite the haul. I shop on an empty stomach and walk out with something resembling Wonka’s factory. The gnocchi looks fabulous! Fran, Im coming to your place for dinner tomorrow night, you go alllllllll out, very impressive. 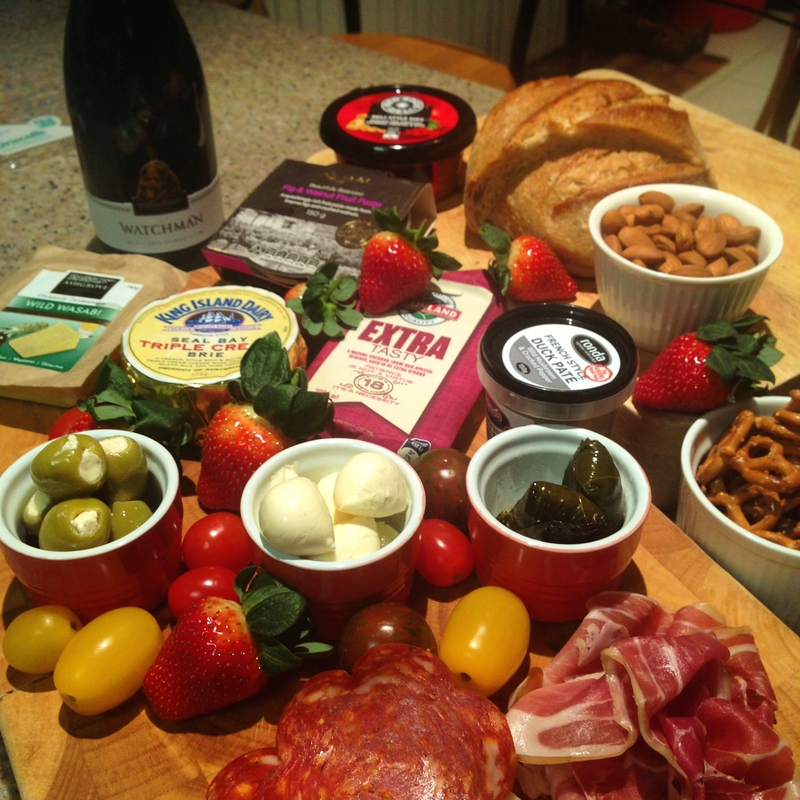 I dont think the left overs in my fridge would come anywhere near creating the gorgeous feast yours did. Sigh! I agree with you re Coles too.